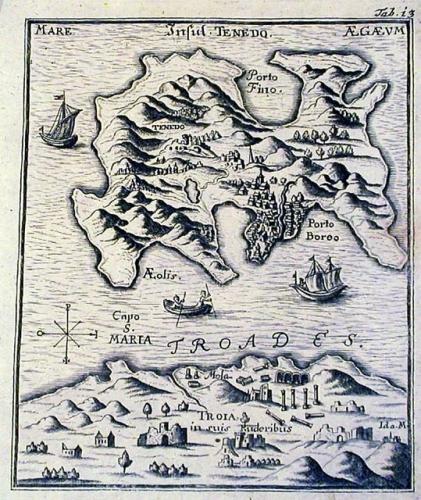 An engraving of the island of Tenedos off the coast of Troy. It seems to have been called by various names, such as Leucophrys, Calydna, Phoenice, and Lyrnessus. The name Tenedos is derived from Tenes, one of the heroes of the Trojan War. In this connexion Homer and Virgil make frequent mention of the island, which was probably used by the Greeks to station their fleet. From a book by A M Myller recounting his travels from 1725 to 1727. Myller journeyed from Rome to Jerusalem then on to Troy, Gallipoli and Constantinople. From Constantinople he travelled to Egypt and then to Syria. Finally from Syria he travelled to Malta and back to Rome. Scarce.